A trip to China really isn’t complete without a visit to Beijing, the country’s capital. I’ve always been obsessed with Chinese history so I knew we needed to stop in Beijing on our latest visit to China to see some of the iconic historical sites. The pollution and traffic in Beijing were definitely not fun, but we still had a wonderful time. We used the company China Highlights to plan a few day trips around Beijing and we were so pleased with our tour guide and driver. Having a private guide and driver made everything easier with kids and it made it so we could fit a lot more into our visit. Below I’m sharing with you our favorite spots from our visit — next time we want to get back to visit the Summer Palace and a few other places. We spent three days (one day was a travel day, so we fit all of our activities into just 2 days) in Beijing and these are all of the spots we visited! Our guide picked us up in a minivan and drove us around Beijing to start off our first day! Considering the traffic (the President of North Korea was visiting at the time), it was so wonderful to have someone else navigating for us. We did have a bit of excitement when our van was pulled over by Communist Guards as we were getting ready to exit to Tiananmen Square, but our driver got the situation resolved quickly. Our driver dropped us off at Tiananmen Square and then picked us and our guide up later for lunch and our Hutong tour. We only spent a few moments walking through Tiananmen Square on our visit on our way to the Forbidden City. We didn’t visit Mao Zedong’s mausoleum, because we thought our kids might be too young for it this visit. I had visited it before as an 11 year old, and we may take our girls in the future. We stopped to learn about the Monument to the People’s Heroes and talked quietly about the many political events that have occurred at the square over the years. The square is impressive and a great place for kids to run around after being cooped up in the car! We wouldn’t suggest planning much time here with young kids, but definitely a stop if you are headed to the Forbidden City. The Forbidden City is huge. It is a lot of walking for kids. We brought our stroller, but you definitely need a stroller that is easy to carry or collapsible because there is uneven pavement and a lot of stairs to go up. Our guide walked us through the Forbidden City in a very kid-friendly way. We stopped to look at various dragon statues, carved walkways, and the Hall of Supreme Harmony (which was very crowded). Our kids enjoyed seeing some of the art galleries throughout the Forbidden City and just running around in open courtyards while my husband and I took turns looking at art/paintings/jade accessories. We also learned about who lived at the Forbidden City in the past and what it is used for now. Our kids loved wandering the gardens in the Forbidden City and looking at some of the ancient trees and statues. You could spend hours at the Forbidden City, but we probably were only there for two hours — it was just right for our kids. Next time we’ll head to Jingshan Park (where you can get a good view from above the Forbidden City) but on our visit the air was too polluted to see much from above. Behai Park nearby is also supposed to be a good place to relax with kids after a visit to the Forbidden City. One of our favorite activities in Beijing was a Hutong tour by rickshaw. The courtyard-style houses, preserved old neighborhoods, and alleyways of Beijing are called hutongs and they are a great place to catch a vision of Beijing’s history and see how locals live even today in Beijing. The hutongs are maze-like and our rickshaw drivers biked through the alleys to give us a glimpse of just a small area on our way to our calligraphy workshop. You can rent a rickshaw (without being part of a tour) or you can also take a walking stroll of the hutongs. Some hutongs are full of shops, restaurants, bars, and cafes or you can wander away from the crowds and find hidden gems. In the midst of an overcrowded city like Beijing, the Hutong visit provided us with a relaxing experience to slow down and see what life might actually be like for some people in China. You will want to make sure to have money to tip your rickshaw driver after your ride, it is expected and appreciated. Our guide with China Highlights arranged a calligraphy class for us in the Hutong district while we were on our rickshaw tour. So we stopped our rickshaw and entered one of the ancient buildings and proceeded to learn calligraphy for an hour. This activity was great for a range of ages — even our four year old could do it. Our guide translated for us while the teacher spoke Chinese and taught us calligraphy. At the end of our time we got to keep a few calligraphy brushes. This activity was one of the highlights of our time in Beijing! You can’t visit Beijing without trying Peking Duck, it is a delicacy and it is known as the first dish to taste in China. We visited Qianmen Quanjude Roast Duck Restaurant for lunch, it has been around for almost 150 years, and it is one of the most famous Beijing Duck restaurants around the world. We tried a variety of side dishes to accompany our duck and the average cost per person was $30 USD. Our kids loved the thin pancakes that you are meant to put the duck in with condiments (like cucumbers, scallions, and sauce). Luckily our guide helped recommend food to try, and we ended up liking our meal better than we thought we would. The restaurant had a fish tank that our kids were obsessed with visiting anytime there was a break in eating and of course they enjoyed spinning the lazy Susan in the middle of the table every chance they got. After our first day of travel we were exhausted and returned to the hotel for an early night. We stayed near Wangfujing Street, so that night we wandered around the shopping area and looked for dinner. Wangfujing Snack Street (formerly called Donghuamen Night Food Street) is a pedestrian street with hundreds of snack stands and shops, which mainly sells nationwide snacks, tourist souvenirs, and folk crafts. For adventurous diners, it is a food paradise with such unique snacks as centipedes, lizards, and deep fried crickets available to eat on a stick. There is nowhere to sit, so you are meant to just stand and eat your food and walk around. We tried the crickets (or at least my husband did). It was definitely a unique experience. Our kids weren’t feeling particularly adventurous though, so they ate dinner at Kentucky Fried Chicken nearby. Our second day in Beijing started with a long drive to the Great Wall. Because we chose to visit the Mutianyu section of the great wall, our drive was about two and a half hours (70 km). We enjoyed seeing the outskirts of Beijing as we rode in the van with our guide and driver. It was a long drive — but it was worth it! We chose to visit the Mutianyu section of of the Great Wall because it is one of the best preserved sections of the wall and least crowded. Also, this section has a lot of watchtowers that are well preserved. But, most importantly, this section of the Great Wall had a toboggan! We arrived at the Great Wall and parked and walked to pick up our tickets. Then we got in line to ride what looked like a ski lift (called a cableway) up to the top of the Great Wall. This was a great way to enjoy the scenery and not have to hike/climb steps to the top. Once we arrived at the top of the wall we wandered along the wall and took pictures. We stopped at the various watchtowers to take pictures and climbed onto the roofs to enjoy the view. This area of the Great Wall is much more enjoyable and less crowded than other areas of the wall that I’ve been to. After we finished visiting the wall, we waited in line to ride the toboggan down from the wall. This activity was one of the highlights of our entire time in China. The views as we slid down from the wall were breathtaking and the activity was very safe and fun for kids. It was a little chilly at the top of the wall, so we brought jackets and sweatshirts with us. After we finished at the wall we wandered the gift shop and stopped for a snack. For lunch near the Great Wall we stopped at westernized-Chinese restaurant and it was one of our kid’s favorite meals in China. This restaurant had some of the Chinese food we are more accustomed to eating in the U.S. and was in a greenhouse/garden setting. This is a popular restaurant for tour groups, so you will see a lot of foreigners, but we quite enjoyed the ambiance and the variety of food available. The average cost was $14 USD per person. After our visit at the Great Wall we braved a lot of traffic to make it back to Beijing to enjoy the Temple of Heaven. The drive was quite long but our kids were awesome. The Temple of Heaven is where originally the emperors of the Ming Dynasty (1368 - 1644) and Qing Dynasty (1644 - 1911) held the Heaven Worship Ceremony. It is the largest and most representative existing masterpiece among China's ancient sacrificial buildings. 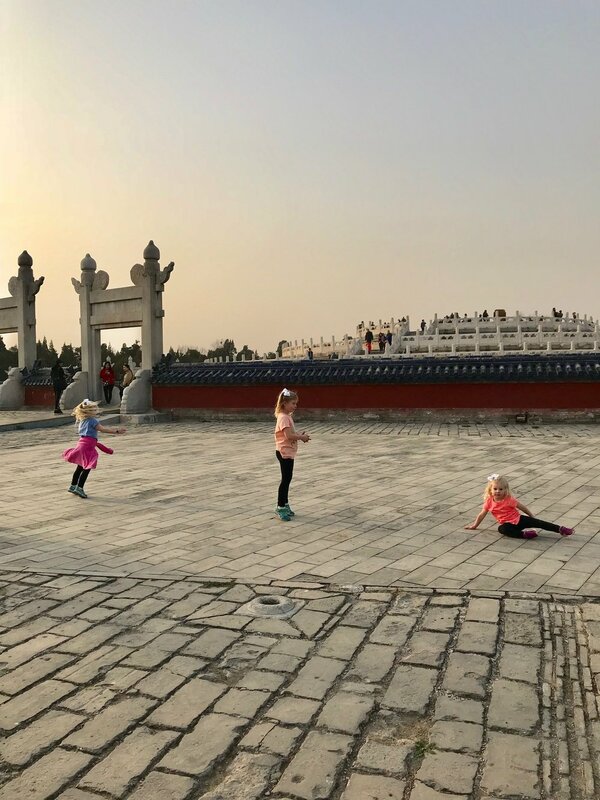 The Temple of Heaven is even larger than the Forbidden City, so we didn’t try to see everything but our kids enjoyed being out of the car and able to run around. 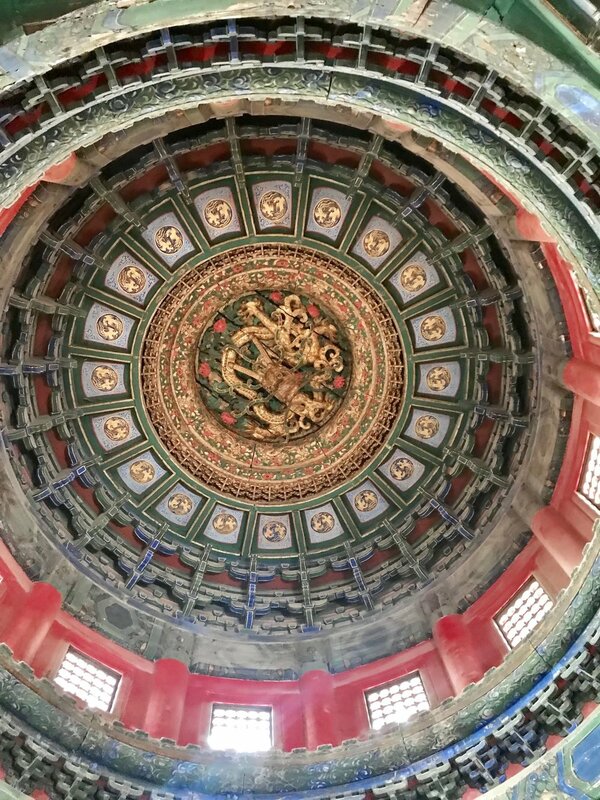 We wandered through the Temple of Heaven stopping at whatever looked interesting and letting our kids run wild. The sun was starting to set, so the view was spectacular. The area around the Temple of Heaven is like a park with trees and various people doing exercise, dancing, playing chess, etc. It was a peaceful place to take kids. We also got stopped repeatedly to take pictures with Chinese families and their children throughout our visit. The final activity for our second day in Beijing was a stop at the Beijing DongTu Theatre Acrobatic Show. We had heard how amazing these shows were, so when offered the opportunity we decided to check it out! We would definitely recommend fitting in an acrobatic show if you get the chance. This acrobatic show was created by the China National Acrobatic Troupe and has many award winning acts and features a combination of Chinese national music, dance, opera and martial art. We sat near the front of the stage and our kids sat in awe the entire show. — but since the theater is small, pretty much any seat is good. The ticket prices average around 100 yuan ($15 USD) and prices depend on where you want to sit. You can find discounted tickets online. Our two days in Beijing were action packed and exhausting. There was a lot of traffic and driving between places in Beijing but we loved the fast pace that having a driver allowed us. We don’t always use guides and drivers, but Beijing seemed harder than some cities we have visited to navigate and it took a lot of the stress out of our visit. We would definitely recommend using a private driver if you are able to, as it will allow you to see much more in a shorter time. After our visit to Beijing we headed to Yangshuo (more to come soon on that). At the very end of our trip to China we returned to Beijing for one night before we flew out to the U.S. We mostly just wandered around Wangfujing Street on our last night in China and found a local restaurant to eat some noodles and rice. Below I’ve included some details about the hotels we stayed at in Beijing. Our first three nights in Beijing we stayed at the Lee Garden Service Apartment, a wonderful serviced apartment hotel near Wangfujing Street. This area is popular with tourists and is a safe/walkable area close to a lot of other hotels and restaurants/shopping. Serviced apartments provide more space than traditional hotels rooms but often have many of the same amenities. This serviced apartment hotel had options for variety of size rooms (we had a two bedroom deluxe suite) and it also had a fully-equipped kitchen, TV, washer/dryer, high speed internet, swimming pool and sauna, fitness center, children’s play room, and restaurants. We enjoyed the breakfast buffet the first morning. We would definitely stay at this apartment hotel again and it was the perfect place to be as we adjusted to the time change and recovered from jetlag. On our last night in China we stayed at the Novotel Beijing Peace before flying back to the U.S. This hotel is modern and had all of the necessary amenities travelers need. This hotel was also located in the Wangfujing neighborhood and we enjoyed exploring this area again. The highlight of this hotel was the adjoining rooms and the swimming pool. One of the bedrooms had a king bed and the other had two twins and the rooms and bathrooms were quite spacious. We loved our time in Beijing! We didn’t stay long, but we were able to fit in quite a few important sites and activities during our visit. 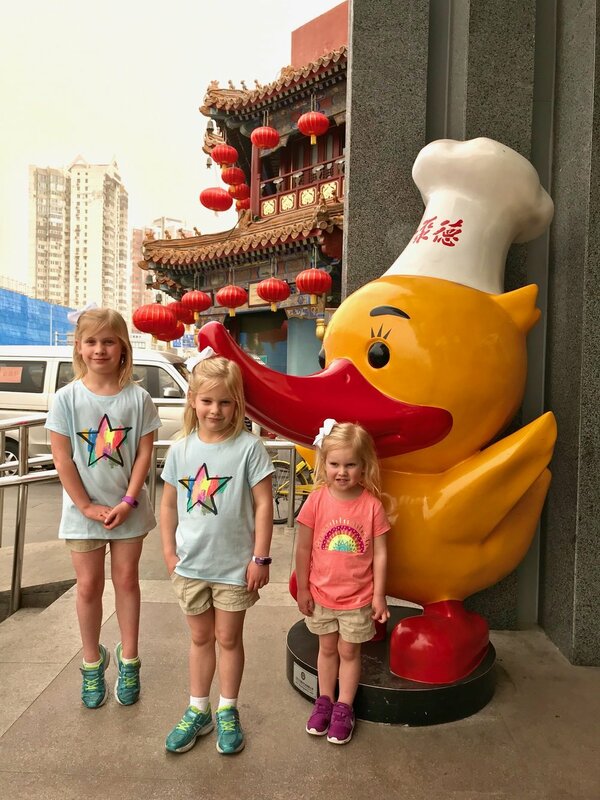 While a lot of people told us that our kids would be bored in Beijing, we had a wonderful time and our kids appreciated the history and cultural aspects of our visit as well as the opportunity to do unique activities. We hope you will find this basic itinerary useful as you plan you adventures in China! Another fun little freebie for all of our followers! So if your kids (or you!) like coloring pages, these are for you! We have one Japan coloring page and a quick guide to some Japanese phrases to learn! Let us know what you think! We came across the Richards family via instagram when we were planning a trip to Spain and Emily gave us a lot of great tips for things to enjoy in Barcelona. The Richards are a family of five currently living in Madrid who love to travel and explore. 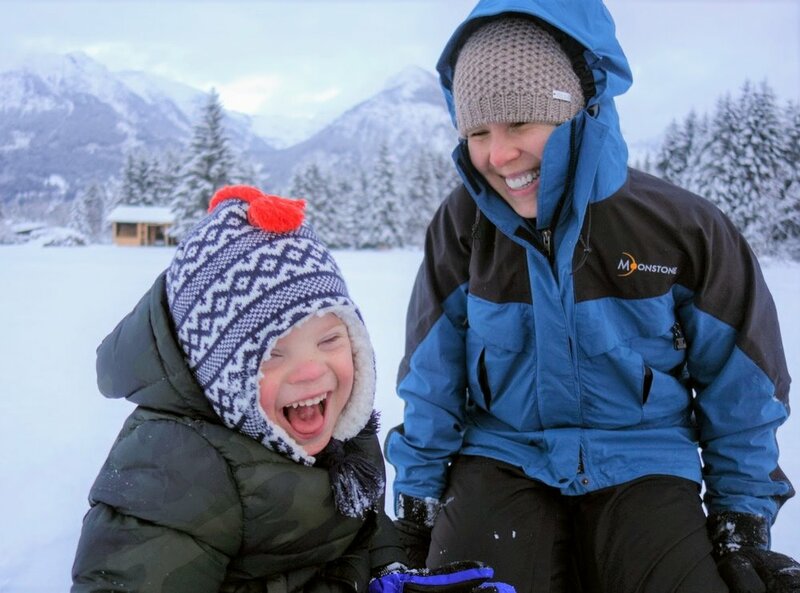 The youngest member of the Richards family, Ben, has Down syndrome and one of their family’s goals with traveling and sharing their story on social media is to show the world that a disability like Down syndrome is something to be celebrated and enjoyed. We are so excited to introduce you to this awesome family. You can follow them on Instagram at @eminthemoment or on their blog Life at the Moment. We have three boys, Parker (10), Emmett (8) and Ben (5). My husband, Todd, and I met in college and after finishing school we moved to the East coast. Both of us grew up on the West coast and wanted to try somewhere new. We bought our first home in Raleigh, North Carolina, and spent eight years there. We loved every minute of it, but always knew we wanted to live abroad at some point and kept our ears open for the right opportunity. We moved to Madrid, Spain after living in Raleigh for eight years. We sold our first home, our cars, and put some things in storage. Right now, Madrid is home and we spend every chance we get traveling around Spain and other countries in Europe. In Spain, the expectation is that you will use all of your vacation time in August. That being said, Spain has a lot of its own holidays that fall in the middle of the week so companies will often give employees an extra day so you take a “Puente” which is “Bridge” in Spanish and basically means you turn your random day off on a Wednesday into a five-day weekend. We travel whenever there is one of these holidays, sometimes we stay in Spain and sometimes we fly to another country, just depends on the time of year and flight prices. We save our big trips for August though as you have five weeks with little to no work distractions to get in some incredible traveling (hard to explain exactly how amazing that is). It’s so hard to choose but I think Switzerland and Croatia are tied for our favorite places, too different to compare but each incredible in its own right. 4. Why do you like to travel with your kid(s)? 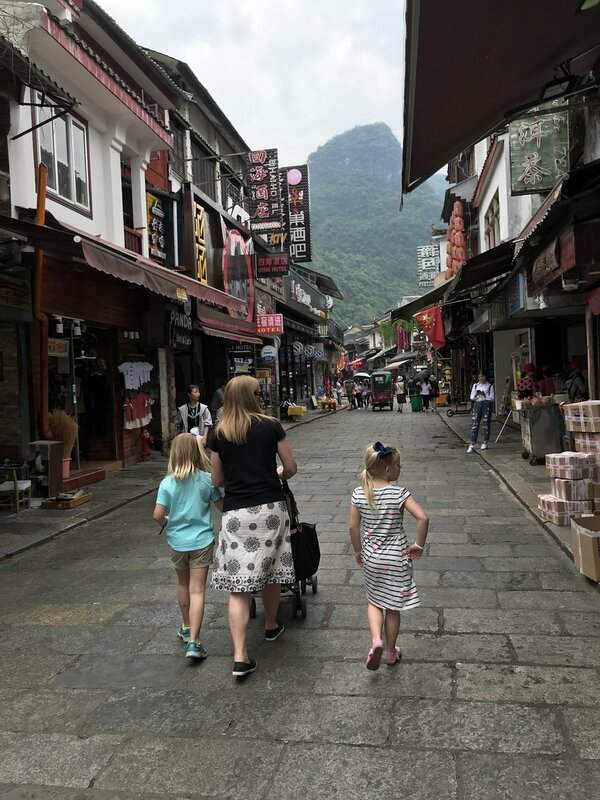 Traveling with our kids was a new concept for us when we moved abroad. We had visited family back west when we lived in the states, but had never really taken them anywhere else other than a couple of road trips. We wanted to change that when we moved abroad. We have fallen in love with traveling with our kids, but I should probably be honest here - it’s not easy. It’s actually really hard sometimes but we’re getting better at it and feel much more confident in our abilities to keep our kids alive and mostly happy when we travel. I love seeing our boys experience new places, try the local foods and we especially love finding kid-friendly things to do like visiting parks and hiking. They don’t always appreciate exactly what they are experiencing in the moment but we are confident these experiences are not going to be easily forgotten. The fact that they are too busy searching for crabs on a private bay in Croatia or riding an alpine slide down a mountain in Switzerland to even worry about playing video games is about as much success as you can hope for. How easy it is to get around. We almost always rent a car and love exploring a new country by car as we move from one destination to another. Technology makes this possible (Google Maps is by far our most used app while traveling) but once you learn the nuances of driving in Europe it is surprisingly easy to rent a car and hit the road without much preparation. We have certainly had our fair share of interesting experiences like driving down what looked like a road but is actually a historic city center where cars are not allowed and everyone is staring at you as you try to inch your way out. Our youngest son, Ben, has Down syndrome. He is the light of our family and makes us smile almost 100 percent of the time and can put an end to any family bickering. This has been a life saver to have on trips to ease the stressful moments. In Spain they are incredibly accepting of people with special needs. They celebrate them and love them. It is not uncommon for complete strangers to come rub his head and say “Vamos Campeon” which is basically, “go get’em champ!” Leaving Spain, the reaction is not the same and generally is skewed a bit more to the negative, but it has been interesting to see how the different cultures react to him. One of our goals with traveling and sharing our story on social media is to show the world, that a disability like Down syndrome is something to be celebrated and enjoyed. We are lucky that Ben’s small enough (not for long) that we can throw him in a hiking backpack and take him anywhere. It has made it possible to expose our family to so many different types of people and cultures, while at the same time show those same people what a joy it is to have a child as special and unique as Ben. Our children’s relationship strengthening has been another hoped for, but unexpectedly successful thing about traveling.For us this also extends to the time we have spent living in Spain, but essentially, you take kids out of their element, and what makes them comfortable and where they have easy distractions (like TV or friends) and they are forced to bond. They really have no one else. While that might sound sad, it isn’t. It is wonderful and so much of the fighting that we get used to at home turns into wonderful moments of boys bonding and coming together in a way that the normal distractions of life make really hard. Obviously, they are still terrible sometimes and traveling can make some situations even harder, but it affords certain opportunities that our boys would never have without the traveling. After weeks of perfect weather, we paid a good sum of money to take a boat to some of the more remote beaches and caves off the island of Hvar in Croatia. It was a stormy day, but they didn’t think it would be a problem. Pretty soon into the trip, it was very clearly going to be a problem. The day was a disaster and we weren’t able to see any of the places they had promised and spent a good hour huddled together with strangers, getting pelted by sideways rain, trying to keep kids from absolutely losing it, and just wondering, what if this never stops? It seemed like an eternity but eventually the rain stopped. After waiting out the storm for a while it was clear we would see none of the places we had paid for. Feeling defeated, our captain set course back to the island. Then someone in the group, asked if we could try visiting one of the caves on the way back since the storm had passed. The captain was thrilled with the idea, I mean if he could just take us to one of the five promised locations surely a refund would be out of the question, so he sped over to the cave and after about two minutes of swimming around the dark cave someone started screaming and my oldest came running up to me and yelled, “someone’s dying!” As it turned out one of the passengers had somehow gotten his fingers caught while he was trying to climb onto the side of the boat and in a totally freak accident, his hand got stuck and caused him to cut off the top section of two of his fingers! His poor wife was hysterical and in total shock. Everyone was. I don’t think we’ll ever be able to erase seeing those two fingers being put into a ziploc bag and on ice for the frantic ride back to the island to meet an ambulance. Our boys couldn’t wait to tell all their friends when they went back to school. We don’t know how it turned out, and it was a very sad thing to see, but we can’t help but look back on that day and just shake our heads, it was impressive how many things went wrong, and is something we will never forget. 7. What are the easiest and hardest parts about traveling with kid(s) (for your family)? The hardest part for us is being together all day. It’s fine for the first couple of days but eventually we all start to get a little sick of each other. To help make it easier, we try to get an Airbnb with a yard where they can escape to in the mornings before we head out for the day. This means that we usually stay out of the cities and have a rental car. But even inside cities we have been able to find places with small courtyards. Our Airbnb in Amsterdam had a tiny yard, and to our surprise and relief, it was filled with frogs. My boys had a blast catching frogs every morning and evening and my husband and I got some relief too. Staying in a bigger place is really important for us so that everyone is getting good sleep and can have some alone time when they need it. And if possible, we almost always work in a hike or some physical activity to wear the kids out. We also love getting away from crowds and finding beautiful beaches and lakes, these are by far the easiest and stress-free travel days. To make things easier we just set low expectations. We have gotten pretty lazy about planning and often wait until the night before to think about what we will go do and see the next day, but not having a big agenda where we feel like we have to see every attraction or else the day is a failure goes a long way in being able to just enjoy our time together. It always makes for a good reason to go back some day and see what you missed. We also give our kids time in the morning and night to just be normal kids and usually this means watching TV. We bring our Apple TV with us everywhere we go. 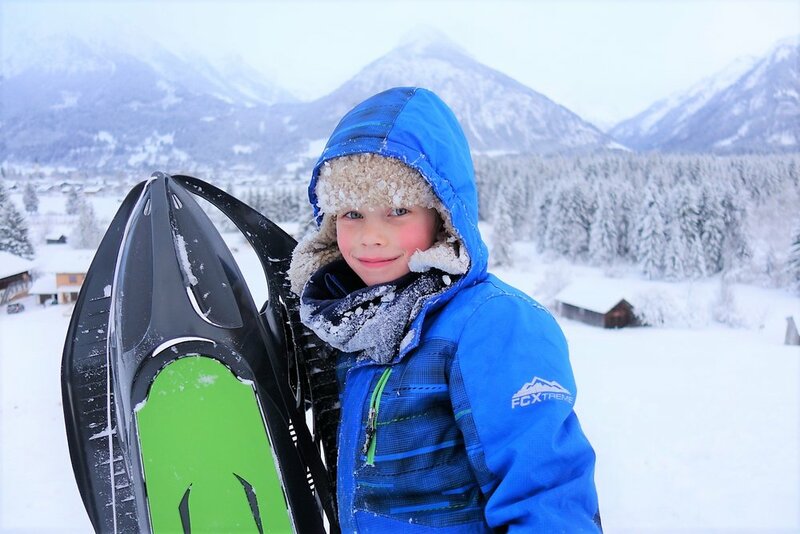 It goes a long way to keeping kids occupied as we get ready to leave for the day or before they go to bed and makes them feel like they get a “break” from what they often consider the manual labor of having to walk around amazing European cities all day. We love Airbnb and always try to find places with a yard where our kids can play and have some time on their own. When it comes to picking a beach or a hike, we try to find something unique and special. Photos on Google Maps and Trip Advisor help a lot, and so do reading the reviews (we always make sure to look at recent reviews to see if it’s closed or something like that). Instagram is incredibly deceiving and often times the real-life reality of a google maps review and accompanying photo will save you from a lot of disappointment. Reviews, as well as street and satellite views have been so helpful for more remote places that don’t have a lot of information online. It is often a far different story than the polished pictures that show up on the 10 best beaches in (insert city) articles on the internet, and has helped us make really informed decisions about what will be best for our family. Our most important resource is obviously our phones. We live and die (literally) by external battery chargers for our phones, and give praise to the EU every day for a regulation they have in Europe that requires cell phone providers to provide free roaming across the continent. This means that when we are in Slovenia, we can use our phones as if we were in Spain, with access to our full data allowances with no extra fees or limitations. It may seem nerdy and technical but it is an absolute game changer. This is made easier by living in Europe but even visitors can take advantage of this. It is very easy to buy a prepaid SIM card at the start of your trip for 20 to 30 euros with a generous data allotment and use it from country to country without worrying about paying $15 a day to use Verizon with tight limits on your data. Go for it! I think most families will be surprised just how doable it all is especially considering how easy it is now to find affordable flights, accommodations and experiences that kids will enjoy. Be honest with yourselves and prioritize. Don’t underestimate the importance of technology and come prepared, but having access to Google maps is the difference between being able to travel with flexibility and adapt to your kids needs or being lost and frustrated (in our opinion). We’ve become very comfortable with what we like and don’t like and don’t feel the pressure to see everything. I want our kids to remember how much fun they had and the time they spent with their family, not what painting they saw. For example, we are very selective about which museums and churches to visit because our boys really don’t like them. They would much prefer to go on a hike or play at a park so we try to find the right balance and when there is a place we think they need to see then we usually get gelato, crepes, or waffles afterwards as a reward for good behavior. My husband’s work schedule is definitely a barrier. Since it’s expected that we won’t use his time off until August it’s very hard to take a day off any other time of the year and have to rely on local holidays for shorter trips. It kills me to see flights deals sometimes but have to remember we get all of August off, and I know how ridiculous it sounds to not be satisfied with a five-week summer vacation, but that’s the travel bug for you, it is a hard thing to get enough of. 11. What are your family’s travel goals for 2019? We are moving back to the states this summer and have a long list of places we still want to see before we do. At the moment, we have a road trip planned during the Easter break to go through Spain and France, a trip to Ireland in May, and a cruise to Italy, Greece, and Montenegro (with my husband’s family) in June before finishing up here in Spain. Then hopefully we’ll be able to spend a month in Scandinavia before going home. 12. What are three items you never leave home without? Food! We usually pack about half a small suitcase with a small tub of peanut butter, granola bars, protein bars for Todd and I, and a couple of kitchen tools that Airbnb’s don’t always have like a whisk and a spatula. In fact, I am convinced that we are the only people in the whole of Europe that require a spatula. We only pack things we can’t get in the country we are going to, and that are vital to making quick breakfasts and lunches for the kids. Apple TV. It is embarrassing, but true. I think it stems from my husband watching Home Alone as a kid and feeling really bad about Kevin’s family having to watch TV in French while they were in Paris and he must have vowed then that his children would have the comfort of American programing on Netflix in any country. It really is a lifesaver for the first and last hour of the day and keeps them off of tablets and other devices and at least we maintain some semblance of being together as a family. 13. Where are you headed next? We have a couple of weekend trips planned in March to San Sebastian, Spain with my in-laws, a weekend away to the Azores (without kids) and hopefully a girl’s weekend to Prague. The big trips start in April when the local holidays start here. Hi Friends! A lot of the questions we get are about how we afford to travel and if we have recommendations/tips for affordable travel and how to travel more. To start off, I want you to know that I’m not an expert on budget travel. There are a ton of great resources out there. Like everything else in life, if something is a priority for you, you can find a way to make room for it in your life. We have not always been able to travel as much as we wanted — but we are finally in a stage of life where we can travel more. In order to afford to travel more you need to look at your current life situation and decide where you can save money or make more money. Look at where you are currently spending your money and then see what you can change. Sometimes you just aren’t in a stage of life where you can fly off to Europe, but you could take a car camping trip somewhere within driving distance. If you want to travel with your family, you can find a way. In this post I’m gonna share some of the ways that I make traveling more affordable and also how we create our family travel budget for the year. I’ve also include a travel budget worksheet you can use (below). But, remember, there isn’t a secret to affordable travel. There is no quick fix. Mostly it involves a lot of searching and work to find good deals, to budget, to save, and to plan ahead. Use Airbnb, HomeAway, or other home rental sites. Hotels and lodging are one of the most expensive parts of traveling. You can find amazing rentals on these sites that won’t break the bank. You can always rent out your home while you are gone too, and make money while you travel. Find cheap flights. We are signed up for the Scott’s Cheap Flights newsletter and we also use several apps/websites to find the least expensive flights (Google Flights, Skyscanner, Hopper, Momondo). There are certain times of the year (November, for example) when flights are at great low prices. A lot of times we base our travel plans on where is cheap to travel at the time we want to go. Join an airline rewards program or use credit cards that help you earn miles. We have Delta and Southwest credit cards and we earn miles when we spend money. We also primarily fly these airlines so we earn miles and status. If you pick an airline program to be loyal too, you can reap those benefits. There are also companies that offer miles as rewards for signing up for a credit card. We don’t love having a lot of extra credit cards, but if you want go this route there are a lot of travel bloggers and websites that have great tips on this (like The Points Guy). Travel in the offseason (or “shoulder” season). Yes, I know this isn’t easy to do with kids in school. But you can usually find great travel deals if you are willing to travel in the offseason (meaning the time of year that it isn’t the most popular or expensive time to travel to a place). Sometimes traveling in the offseason means lousy weather, so you’ll want to be careful where you pick to travel. When you Google the cities or countries you want to travel to most of the time it will say when the offseason is. For example, we have had some of our favorite visits to Paris in February and March when it isn’t crowded with tourists. Watch for deals all the time. We like to use the calendars on Google Flights to watch flights and to figure out when the best time to fly are. If you are watching trends in travel pricing you can get a good sense of what is a good deal when you see it. We also set a limit on ourselves in terms of spending (for example, I set an amount that I won’t go over for hotels or flights). We monitor a lot of travel accounts on Instagram and Facebook and look for tips and deals constantly. We usually have a list of places we want to go and if we see a good deal we try to make a decision quickly whether to book. Look for ways to cut expenses in your everyday life. Making travel affordable might also mean looking at your every day life and making changes to be able to afford to travel. Look at your grocery expenses, TV or cable bill, shopping habits, excess subscriptions, transportation costs, misc bills. There are a lot of great resources for budgeting online that can help you get a handle on your spending and see where you can make room for travel. Even if you save a little bit each month in a travel savings account over time it can add up!! We hope some of these tips will help you! Also, I thought I’d share a little bit here about how we create our family’s travel budget for each trip. You will want to have a general travel budget for the year and then set that money aside and save it somewhere so you don’t spend it!! Then, for each trip we try to make a general budget from that amount. For example, if you are going to go on two big trips for the year you will have money more to spend per trip than if you are trying to do five trips. Using this budget worksheet (or sometimes I just write everything in my Notes on my iPhone) you can make a plan for what you want each trip to look like. The biggest expenses we’ve found for traveling are accommodations and transportation (mostly flights). But when you don’t plan ahead you can also be surprised by small expenses that add up. For example, we found amazing flights to London a few years ago and then later decided to fly to Vienna and Budapest while we were there. Well, those shorter flights were super expensive and we should’ve factored them in originally. Or, when we went to China the visas and visa processing was much more expensive than we planned for, even though our airline tickets where cheap. Once you have created a travel budget, you want to try and stick to it! So as you try and estimate costs do your research and also assess your family’s habits. If you like to stop for gelato three times a day, add that into your budget. Also, as you research for your trip you can assess what activities are going to be expensive and then decide whether or not to do them. Then you can set your kid’s (and your) expectations. If you don’t have the money to afford Disneyland but are visiting Los Angeles, you will want to remind your kids ahead of time that even though they see Disney signs everywhere, you aren’t going this time. We want everyone to be able to afford to travel, but travel looks different for everyone. Look at your life, your finances, and your dreams and then assess what works for you. We hope that some of these tips will help you reach your travel dreams in 2019, or in the future!